Is there concerns in Knowlton that the most prevelant signs on the side of the streets are "for sale" and "for rent" signs? Is there some sort of re-structuring of Knowlton that is making this glut of real-estate occur? One has only to look closely at the homes and bussinesses in town to see that there could be something to raise concern among residents. 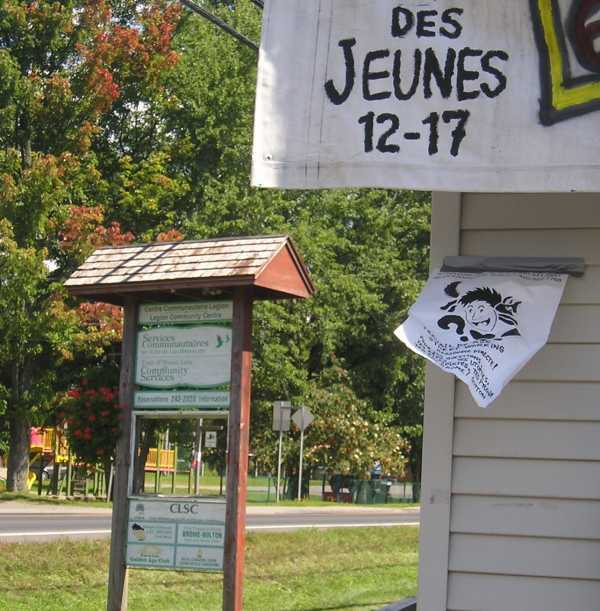 Of course we are proud to proclaim our village as one of the most beautiful villages of Quebec but is it something that has been taken for granted? Knowlton is home to many events and festivals throughout the year that bring tourists and visitors from all over the Eastern Provinces and States as well as from Europe and even further away based on a reputation that has been built up over years of traditional good hospitality and a charming, picturesque village. But has the lustre begun to fade from this jewel? There seems to be no shortage of signs and buildings in Knowlton that literally seem to be reaching states of...well, quite frankly...disrepair! 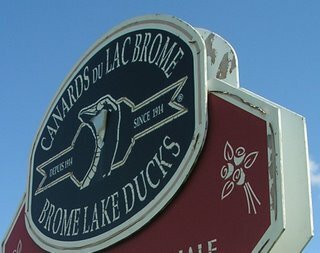 With our renowned Duck Festival just around the corner it seems a tad ironic that both of the Brome Lake Duck Farm sign looks quite slovenly...with peeling paint and decals they are almost un-readable. Of course there are examples everywhere of neglect and while many private bussinesses in this global economy do not have the extra funds to appropriate for signage and landscaping you'd think that Knowlton's collective pride would compell us all to tidy things up a bit. One senior's home on Knowlton Road has a completely un-finished exterior wall and everyone who enters the village is exposed to a clap-board strapped wall of styro-foam faded pink insulation! It's been this way for several years now. I am a resident of Knowlton a concern of mine, which I am sure is a shared by many residents of Knowlton, is the decrepit state of many of Knowlton's business signs and storefronts. Have you looked at the state of some of the signs in Knowlton recently? There are signs that are in such a state of disrepair that it almost seems fairer to put a torch to them and put them out of their misery. Arriving into Knowlton on the highway from Cowansville looks like a mix of garage sales and ghost town remnants! Stores with hand drawn signs on bright colored poster board, warped and leaning signs made out of pressed lumber painted in what looks like cheap paint hanging by rusted chains, colored flags, faded and tattered, looking like an abandoned used car lot. The list is long and these signs are not hard to spot! Dear me, even the Duck Farm sign is barely legible and is peeling, not to mention the parking lot with one crooked SAQ fluorescent sign and two abandoned metal sign posts...how tragic! This doesn’t seem to phase city hall one bit. Actually, while visiting one local business I was shocked to over-hear that city hall was extremely upset with their sign. What sign is this you may ask? Is it one of the signs that is falling apart, chipped paint, crooked, rusted and causing an eyesore to visitors? No...it is a brand new sign, probably costing several thousand dollars, that has raised the ire of Knowlton's officials. 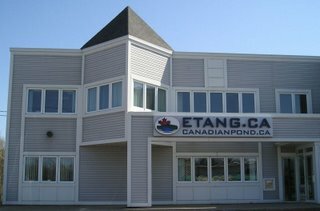 Speaking with an employee of the pond store confirmed that, indeed, city hall wanted to pull the plug on their brand new sign. Most people have probably not even seen it as it is only visible when you are in front of the building. 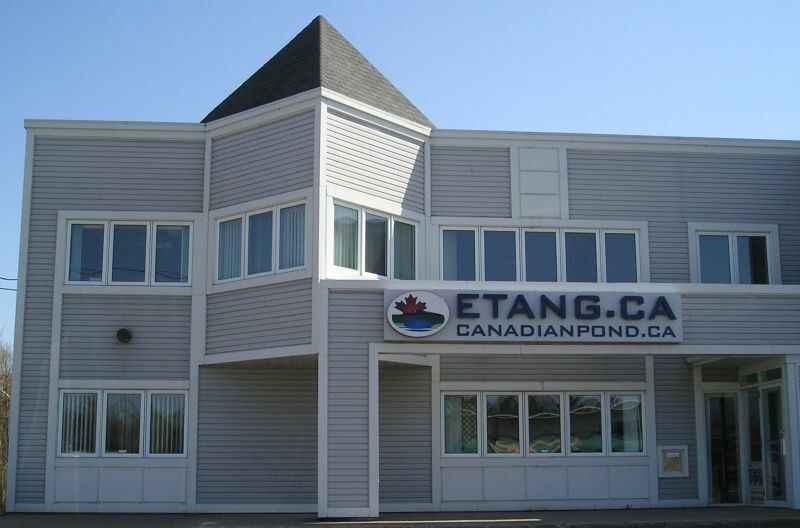 I'm talking about a new sign that is now on the Esso Gas station building on the corner or Knowlton Road and Victoria. Now how could these elected officials seriously have a problem with this sign and yet be blind to the fact that right across the street from this sign there is a ramshackle wooden sign practically falling over with peeling paint and bright pink paper with handwritten letters as a window display? Is this the sort of signage that Knowlton City Hall prefers for the image of Knowlton? Apparently yes because they seem to ignore these examples of tumble-down signs…even their own fire department has a sign that has literally fallen apart! Our brave fire-fighters deserve more respect than their current sign offers! Now how could these elected officials seriously have a problem with this sign and yet be blind to the fact that right across the street from this sign there is a ramshackle wooden sign with peeling paint and bright pink paper with handwritten letters as a window display? I can't comprehend the logic! Is there some law against nice new signs? When I look around at other signs in Knowlton of all different styles and in various states of decay it seems strange that there is this one new sign that is deserving of such attention and if it isn't because someone at city hall has an axe to grind I can't see how else city hall can find the time to want to complain about a new, modern, stylish and discreet sign when there are some many examples of similar signs and even worse, decrepit and derelict signs without an ounce of attractiveness or charm? It is understandable that a town wants to have a vision and maintain a theme but some of the signs along the road into Knowlton look like they were painted 20 years ago and haven't been touched since! What must visitors think when they seem peeling paint and dirty overhanging canvas and flags drooping in town? Even the municipal fire department sign, while in wood, is half missing and looking like a broken down western movie set prop! The signage right beside the tourist info-center, in the heart of the village, is listing to the side and looks like it has been attacked by a knife...the paint is chipped and faded...what a poor image to project. Why isn’t city hall pro-actively concerned about this? What about the Mill Pond? What about our roads and water supply? 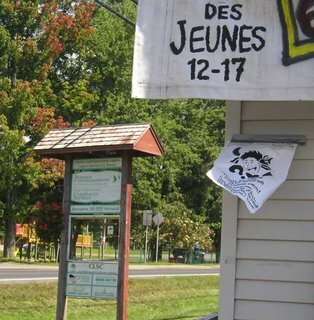 I'm not too happy to see elected officials use their powers on such minutiae as a nice new sign when, my goodness, some of the signs in Knowlton are so sad that tourists must ask why is this town being rated as one of the most beautiful villages of Quebec? We deserve to know that our elected officials are trying to work with the community to make it a better place. Why not work with businesses who want to make Knowlton their home instead of working against them? 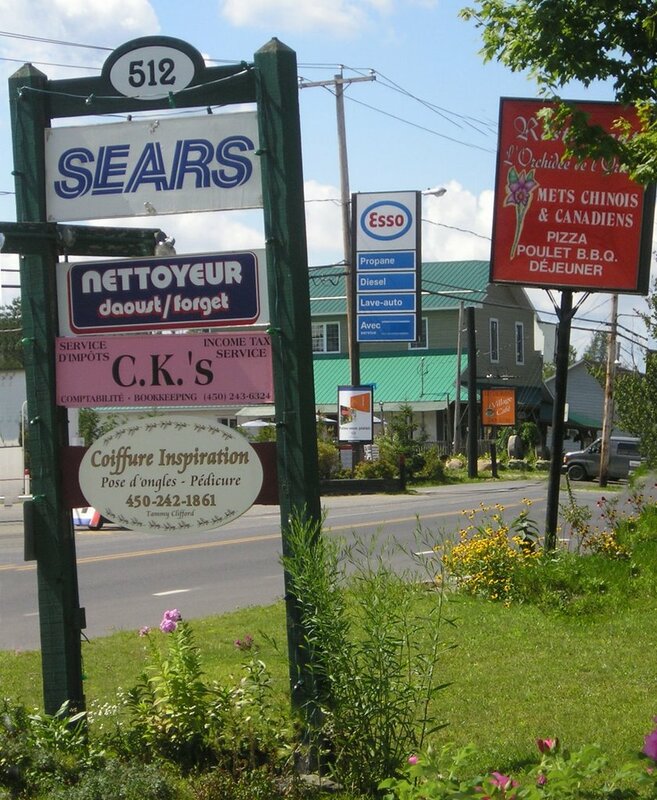 Have you seen how many stores are for rent and for sale in Knowlton? City Hall would better spend their time, and our money, fostering a spirit of community. 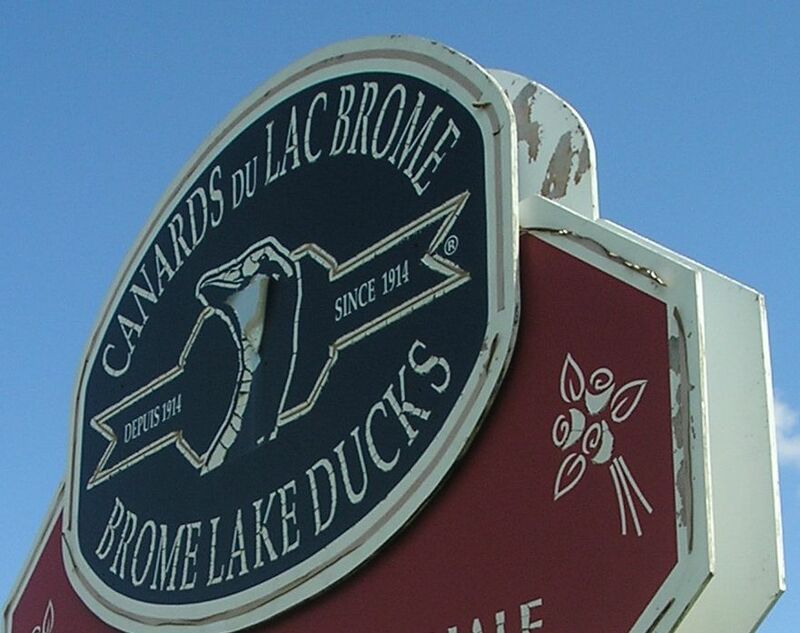 It is difficult for the average resident to be completely abreast of the laws and rules of Brome Lake Municipality but it seems simple enough to take a look around the village and see some inconsistancies or areas where improvements could be made. It seems odd that the elected crew would allow their own fire department sign to fall to pieces and find it o.k. to turn an eye to gaudy flapping faded flags and seem unphased by unfinished buildings and crooked sidewalks and yet get their feathers ruffled over a sign. The financial investment of this business owner in their sign says alot about his or her desire to create a modern and progressive image and the fact the town of Knowlton would object to such thinking shows that maybe they have had their priorities skewed. Many small towns whether it be in Vermont or British Columbia that have succeeded have done so by coming together with a communal vision and a spirit of togetherness. It does no good to point fingers and raise voices, what Knowlton needs to do is set an example before things are suddenly out of our small local hands and into the cold hands of foreign business interests. With the 150th year of the Brome Fair perhaps it is time to look back on what makes Knowlton great and try to bring back the spirit that made us one of the best villages in the Eastern Townships!